(Nanowerk News) Perovskites have recently emerged as a most promising material for low-cost production of highly efficient solar cells. In particular, the so-called organic-inorganic metal halide perovskites are among the most exciting recent discoveries in the field of photovoltaics in. In less than five years, researchers have succeeded in increasing the energy-converting efficiency of perovskite-based solar cells from 4 to more than 20%. Indeed, in this respect, these relative newcomers have already overtaken many alternative photovoltaic materials, such as purely organic ones. Furthermore, perovskites are not only capable of absorbing light and converting it into electricity, they also display outstanding properties as light emitters. Now a group of LMU researchers led by Alexander Urban and Carlos Cardenas-Daw at the Chair for Photonics and Optoelectronics of Professor Jochen Feldmann, has succeeded in synthesizing perovskite nanocrystals in the form of ultrathin nanoplatelets whose emission characteristics can be tuned by altering their thickness. The resulting nanoplatelets are some 300 times thinner than the perovskite films conventionally used in the fabrication of solar cells ("Quantum Size Effect in Organometal Halide Perovskite Nanoplatelets"). 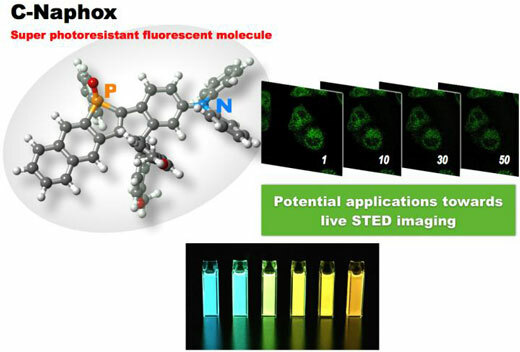 Colloidal suspensions of perovskite nanocrystals that emit light of different colors. “The platelets are so thin that I could hardly believe my eyes when I first saw them in the electron microscope,” says Jasmina Sichert, a PhD student in Feldmann’s department and first author of the new study. By systematically altering the relative concentration of organic cations used in their synthesis, the Munich researchers were able to obtain nanoplatelets that were less than 1 nanometer thick, corresponding to a layered stack the height of a few atoms. “I was absolutely astonished that, in spite of their enormous surface area, these platelets emitted such an intense blue luminescence,” adds Alexander Urban. In fact, the properties exhibited by these minuscule particles are inexplicable in the context of classical physics. They can be accounted for only by invoking the laws of quantum physics, as confirmed by theoretical calculations carried out by the team. Moreover, not only could platelets of varying thickness be produced in a controlled manner by modifying the conditions of their synthesis, these changes also resulted in striking alterations in their optical properties: In fact, the light emitted by the perovskite nanoplatelets was found to depend on their thickness. By adding layers to the crystal lattice, the researchers were able to progressively change the color of the emitted photoluminescence from violet to blue and finally to green. “We now hope to extend the tunability of the radiation emitted by our perovskite nanocrystals over the entire visible range and beyond. This would make it possible to manufacture energy-efficient and economical LEDs that radiate light of virtually any desired color,” says Jochen Feldmann. In addition, the novel nanoplatelets are ideally suited for use in lasers.